The Matchstick Monkey has been a life saver for these two (and their mama!) so much so, that I had originally only bought one for them to try, but due to their constant fighting over it, I'm going to have to get another one! This unique design makes it easy for them to soothe those hard-to-reach back molars and relieve the pain fast. The best hack I've found is to apply teething gel to the bumps on the back of the Matchstick Monkey's head - you can tell it helps to relieve pain to their poor gums quickly and can see how much happier they are after gnawing on Mickey (Oh, yeah, by the way, we named our monkey) for only a minute! 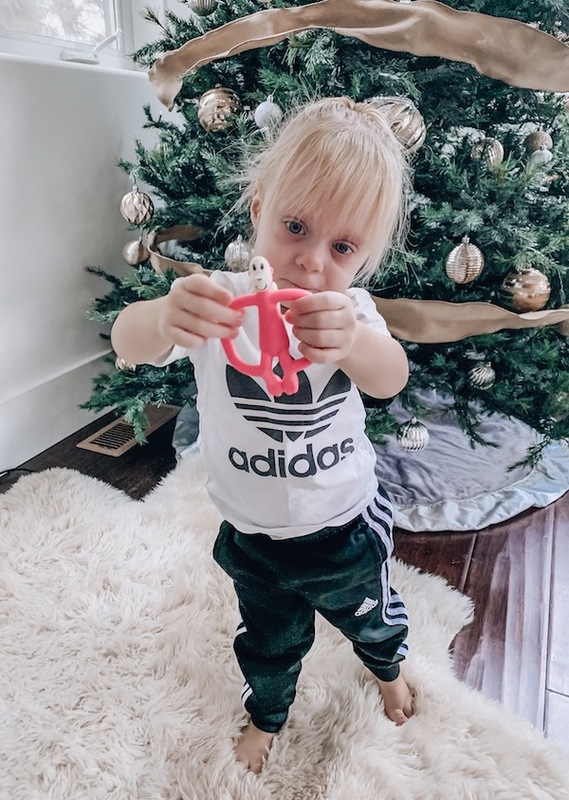 I also love that THEY love this teether so much because they are always carrying it around and playing with it, so it's always on hand when they need that quick relief. We purchased the Original Matchstick Monkey which you can find HERE, or there is also the cute Dancing Matchstick Monkey (HERE) that offers more textures for your teething little! This is a sponsored conversation written by me on behalf of Matchstick Monkey. The opinions and text are all mine.